COURAGEOUS COUNCILLOR WILLIAM WALKER: REFUSING TO BOW TO THE GURU MAGGOT BAAL!!!!!! | AMERICAPHILE RESURGENT!!! ← HUGH REILLY, CULTURE WARRIOR!!!!!! COURAGEOUS COUNCILLOR WILLIAM WALKER: REFUSING TO BOW TO THE GURU MAGGOT BAAL!!!!!! DOWN DISTRICT COUNCILLOR WILLIAM WALKER HAS HAD ENOUGH!!!!!!! One unionist politician has vowed to boycott official stationery bearing [LEPRECHAUN], after his council opted to adopt a new bi-lingual logo. Down District Council this week voted to approve a new logo, similar to the old one but with [LEPRECHAUN] underneath, following on from its decision earlier in the year to gradually begin introducing dual-language signs. 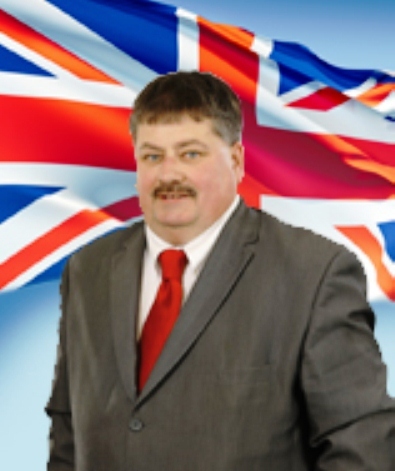 However, in the wake of the meeting William Walker, DUP councillor for Rowallene, contacted the News Letter. “I’ve no time for the [LEPRECHAUN] language when it’s being shoved down your throat. Where is the equality in this?” he said. The logo was approved on Monday, and as the council’s old stock of stationery runs out, it is expected to be replaced with new material bearing the fresh logo. And when that runs out? “I’d be refusing to use council stationery. I’d print my own,” he said. “I have a basic right to refuse… Why do we as councillors not have the right to decide what goes on our stationery? SO TRUE!!!!! IN FACT, SINN FEIN/IRA/PSNI/SJ/LAD ARE TRYING TO INDUCE COUNCILLOR WALKER TO EFFECTIVELY SEND DEATH THREATS TO HIS OWN CONSTITUENTS!!!!! 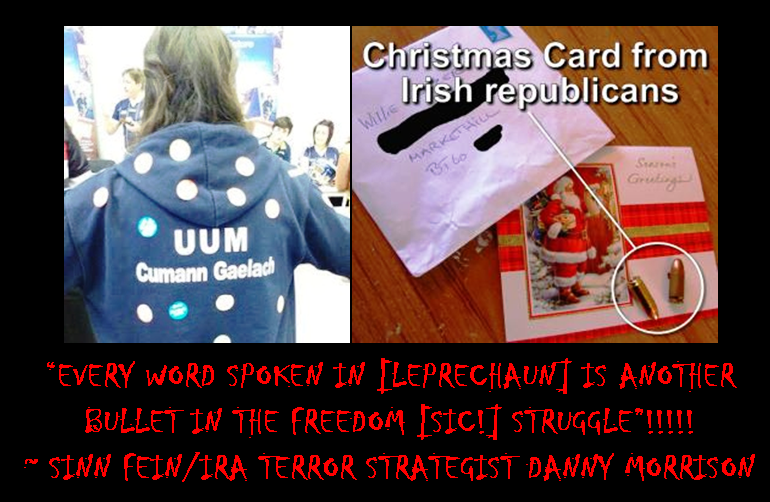 SINN FEIN/IRA TERROR STRATEGIST DANNY MORRISON ONCE SAID, “EVERY WORD SPOKEN IN [LEPRECHAUN] IS ANOTHER BULLET IN THE FREEDOM [SIC!] STRUGGLE”!!!!! COUNCILLOR, PLEASE CALL EDUCATOR AND JOURNALIST HUGH REILLY TODAY!!!!! THOSE FOR LANGUAGE FREEDOM MUST JOIN FORCES AND COLLABORATE!!!!!! “FOR THEN WILL I TURN TO THE PEOPLE A PURE LANGUAGE…” ~ ZEPHANIAH 3:9. Posted in Uncategorized and tagged HUGH REILLY. Bookmark the permalink. Pingback: BERT JOHNSTON SPEAKS OUT FOR LANGUAGE FREEDOM!!!!!!! | AMERICAPHILE RESURGENT!! !